It's a good time to be a Sydney-based fan of all things sour, spicy and noodly at the moment. 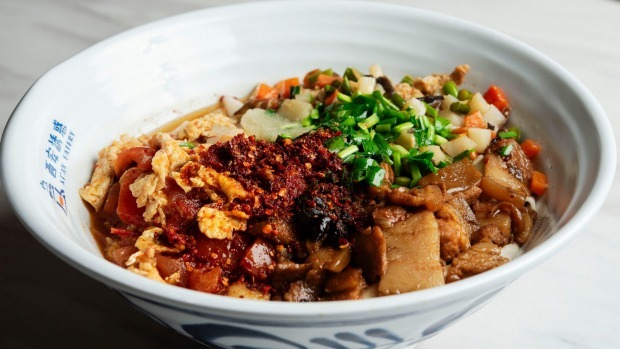 It could be argued that our exceptional handmade Chinese noodle joints have meant that it's always been a good time – but now more so than ever with the recent rise in restaurants selling Shaanxi cuisine – the native food of Xi'an in north-western China. 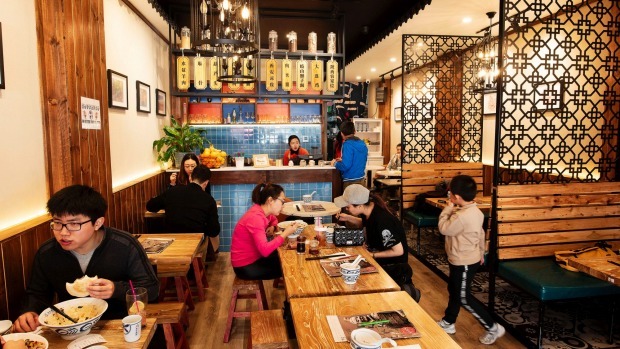 Leading the charge of especially good times in Sydney is Xi'an Eatery, which opened last September in Burwood and is open every day of the week, serving up bowls of thick, handmade noodles doused in chilli and vinegar with meat and vegetables. 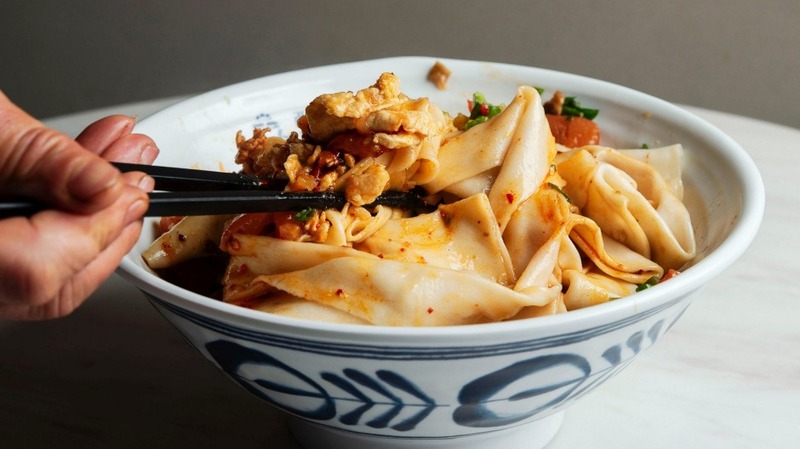 Available hot or cold, the phenomenally chewy wide noodles alone are reason for a visit, more closely resembling pappardelle than your average soup noodles. Once you're there, it's borderline impossible not to just fill up on everything on the menu with the word "signature" in the description, such as the signature cold noodles, the signature biang biang noodles or the fabulously fatty signature pulled-pork burger. But owner Nick Shi encourages exploring as much of the menu as possible. The handmade liang pi, which translates somewhat disturbingly as cold skin noodles, is a favourite, with its tangy, sweet, savoury, herbal and nutty flavours. He also recommends the classic Xi'an lamb vermicelli soup (yang rou pao mo), a steaming bowl of hot lamb stock filled with pita bread, rice noodles and pickled garlic. "This is unique to Xi'an. The soup is very thick with tender lamb and pita soaked in broth. You get a very strong flavour that is so heart-warming especially during winter months." It was definitely his family that influenced Shi's decision to open Xi'an Eatery. "My wife, Kimmy Zhang, is a native of Xi'an and she grew up eating all the 'xiaochi' or small eats as they are locally known," says Shi. "They're characterised as being value for money, very filling and full of flavour." "My mother-in-law, Mrs Hong Shen, was the inspiration and driving force behind Xi'an Eatery. She has over 30 years of experience in the restaurant business. She has had a number of restaurants back in Xi'an, including a hotpot restaurant, which she ran for about 10 years. "When she came to Sydney we started our first restaurant venture and took over Rice Vermicelli King in Eastwood. Three years on, we opened Xi'an Eatery." Xi'an Eatery's biang biang noodles are definitely the star attraction, and are some of the best (and chewiest) you'll find in Sydney. "The history of this dish goes back thousands of years and is a core staple of everyone growing up in Xi'an," Shi tells me. "The character 'biang' in Chinese is widely considered as the most complicated character there is. So hard that the dictionary has even given up on it, so you won't find it in the Chinese dictionary." 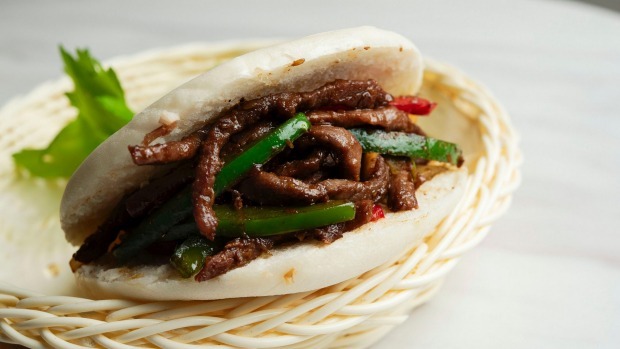 You will find it in Xian Eatery's kitchen, where Shi's chefs stretch long thick strands of dough before boiling them and serving them with a combination of stir-fried meat, vegetables, chilli and oil. "You should smell the kitchen when we're making these all day long!" Shi boasts. "Once you get the noodles, make sure to mix it all up completely to ensure all those flavours gets to every bit." A recent addition to Chinatown's upper Dixon Street strip, Biang Biang's noodles are top notch but it's the flaky pastry surrounding soft stewed pork that makes their "burger" a must order. 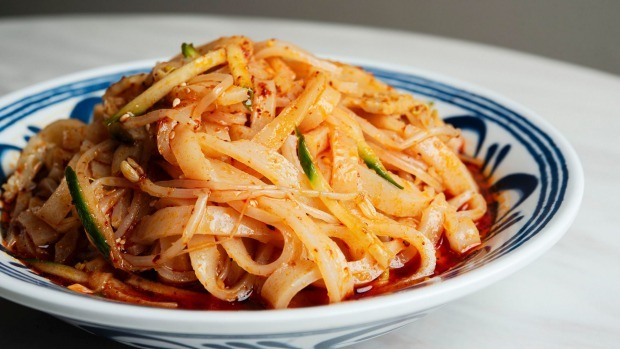 Around the corner from Xi'an Eatery is the humble Cheng's, whose huge menu features a number of Xi'an classics, including a brilliant cold noodle with chicken and egg. Nick Shi's family owned this local favourite before opening Xi'an Eatery and there are a lot of similar dishes on the menu – plus an extensive list of hotpots.